Many of our items at lift trucks have an interesting story to tell, whether it is a “Jesus Saves” sign from a glue-sniffer in a flophouse (See it here), or a shoebox with multiple price listings (See it here) . However, one item we have still remains a complete mystery. This teller box dates to around the 20’s, but its purpose stumps even the LTP experts. At first it seemed like a standard salesman model. Salesmen would travel around with scale models of fireplaces, bathtubs, etc., so they could show what they where selling (without actually carrying around a fireplace). But, we realized this piece was too large and fragile to be carried around door-to-door. Also bank teller boxes where part of each bank’s design, and not something that could just be replaced easily. The mirror is the real unknown in this item. It is angled mirror where the teller would usually sit, and it gives the illusion of seeing a large background (since it reflects what’s being seen on the side). Naturally, we though this piece could be part of our carnival collection. We have rigged gambling wheels and milk jugs that are impossible to knock over, so why not something with mirrors? Our friend brought up the old “girl to gorilla” illusion, where a girl would “magically” turn into a gorilla at carnivals. The girl would stand in front of a two-way mirror, and the lights would turn off and illuminate a gorilla behind her (See a video of it here). Obviously gorillas aren’t two inches tall, but it shows how mirrors where commonplace illusions for carnies. This illusion would most likely have to with money (which is surprising because carnivals are usually so honest). It appears to double whatever money/valuables are put inside the box because of the mirror image. Maybe this was used as a prize/betting box to make the pot seem a lot bigger than it actually was. The teller window could be a novelty guard for the “huge” prize. But, we realized there was nothing on the top to keep grubby hands from stealing, so unless this piece is incomplete we can’t write it off as a carnie trick. Then we researched to see if banks actually used boxes like these, and found some really interesting results. 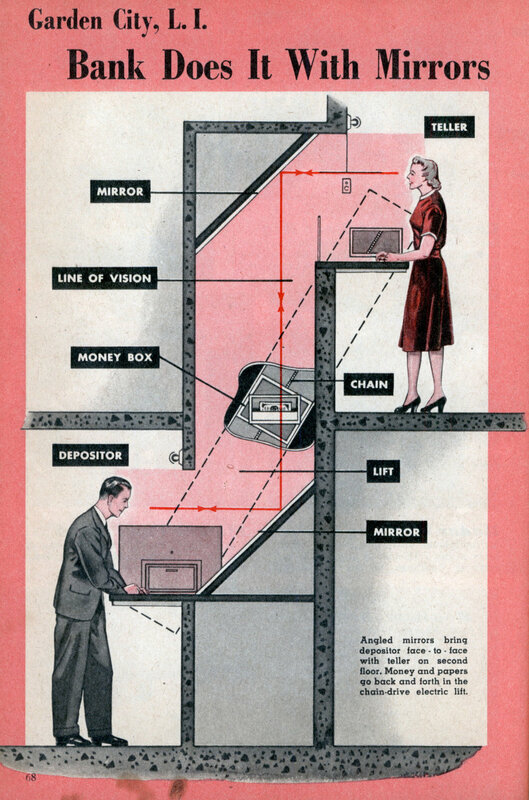 Before the use of ATMs, a few banks actually used mirrors in remote locations. Separate from the bank, there would be stands where a car could drive up, and speak into a mirror to a teller underground. The teller would use a pulley to get the money to the driver, and this way he would be safe from robberies. Maybe the banks even advertized having “TMs” (teller machine), although you probably couldn’t use it at a bar at 4am. We also saw one instance of an actual bank using mirrors. Back when actually walking into a bank to get money was popular, one owner saw a unique solution to the rush hours. To have lots of room on the ground floor, a Long Island bank set up its notes department on the 2nd floor (which was very common). However, during peak hours, the tellers would get overwhelmed with running upstairs all the time. So they had they tellers upstairs, and the customers would speak into an angled mirror to get funds lowered to them. This still doesn’t explain why there would be a small model of the teller box , we’ve heard of collecting model trains, but model banks? Also the mirror isn’t facing up/down, and doesn’t have pulleys. Maybe this model was used to practice for an Ocean’s 11-or age appropriate to the 1920’s, a Bonnie and Clyde style robbery? Who knows? If you do, please post your answer to one-up the Lift Trucks experts. We will select the best answer and give the winner a LTP T-shirt. This entry was posted in Uncategorized and tagged Antiques, Bank Memorabilia, Carnival, Double your money, Illusion, Salesman, Store Display. Bookmark the permalink.